Relay for Life Brings Students Together to Fight Cancer | The Gettysburgian. 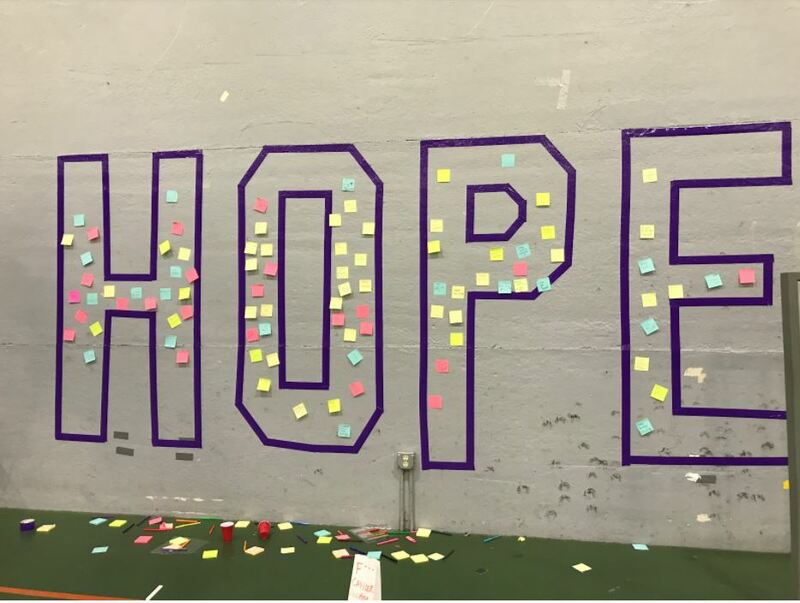 Starting Friday night and continuing into early Saturday morning, Gettysburg students and some community members gathered together in the Bream Wright Hauser Athletic Complex to help fight cancer in the campus’s annual Relay for Life. Organized by Colleges Against Cancer, this year’s Relay for Life raised over $28,000 (not including a few scholarship donations) that will help the American Cancer Society fund cancer research and patient care programs as well as spread awareness about the ongoing battle. Over 800 people participated — more than in years past — to help stamp out cancer at this year’s event. After the Opening Ceremony, survivors of cancer from the college and the community gathered near the stage to receive a flower and a cupcake with a lit candle. The cupcakes represented the goal of the American Cancer Society to create more birthdays by saving more lives. Survivors then took the first lap around the track while students stood along the sides and cheered them on, as “Fight Song” by Rachel Platten played from the DJ booth. Throughout the event, relayers walked around the track and visited the many tables run by campus clubs and groups, including Greek organizations, the cheerleading team, FourScores, and the College Democrats, among others. These tables offered homemade pancakes, face-painting, cupcake-decorating, coloring, and bean toss, to name a few of the various activities. Relayers could enter a raffle that gave away such prizes as KanJam and a mason jar set. Food was provided by the Servo Truck as well as pizza from Antica Napoli Pizza, wings from the Blue & Gray Bar & Grill, and Italian ice from Rita’s. Dance performances by Zouave and Bomb Squad and acapella performances by FourScores, Drop the Octave, and Upscale kept relayers entertained as they walked to end cancer. During the Luminaria Ceremony, guest speaker Marcus Josey ‘20 shared his story about his ongoing battle with acute lymphocytic leukemia. He advised relayers to “never go through pain without a purpose” and explained how he has refused to allow his cancer to prevent him from spreading awareness and using his voice to speak for those who cannot. He also reminded relayers to remember how important events like Relay for Life are and how life-changing they can be. Relayers then walked silent laps in complete darkness with glow sticks, which they placed in white paper bags, decorated to honor those who have struggled with and who continue to struggle with cancer. As the event moved into the early hours of Saturday morning, a significant amount of students remained in the fieldhouse, committed to walking and helping to fight the ongoing battle against cancer. Another Relay for Life fundraising event will occur at the Blue & Gray on April 4, during which 10 percent of the night’s profits will add to the total money raised for the American Cancer Society. Madeleine (Maddie) Neiman '21 is pursuing a double major in History and English (with a writing concentration) and a minor in German Studies at Gettysburg College. On campus, she is an executive member of Alpha Phi Omega, the national co-ed service fraternity, as well as an Ambassador for the Admissions Office and a Peer Learning Associate for the German Studies Department. A lover of traveling, Maddie has ventured to nine different countries and hopes to explore the globe further in the future. For updates and more, follow Maddie on Twitter @madsmaria.